Thursday January 23rd 1890 I got along nicely with the work in the morning with Wills help but just before noon he got to feeling so badly that he had to lie down. Mother came in the afternoon. I got Will into our room and was with him most of the time. weather not quite so cold as yesterday. Friday January 24th 1890 Will passed a miserable night and I sent tfor Dr Kesaber this morning. I was busy with the work and taking care of him all day. We got the rest of the ironing done. Lee stays out to Otts nights since he is sick. Saturday January 25th 1890 We were busy with that work all forenoon. Hatt came over and stayed till after dinner and Mother went to town with her. Will was up the later part of the day. Mother got home just as supper was ready. I was very tired and went to bed early. Will is better. Thursday January 26th 1890 It was a gloomy morning and threatened rain. Mother went over to Otts and staid all night. I was busy all the forenoon about my work. I read some in the afternoon and evening besides writing a little. Pierce come tonight. Monday January 27th 1890 I got along nicely with my work this forenoon. Will was over town and when he came to dinner he said Ott wanted me to come over this afternoon him and Fanny are going to stay down at Hatts for a week. We had some talk about this settlement with Peter about the west farm. I think it is all arranged now. a nice day. Tuesday January 28th 1890 I was bust about the house work all the forenoon. Winnie and Mr Pierce are both sick. I knit in the afternoon & evening. 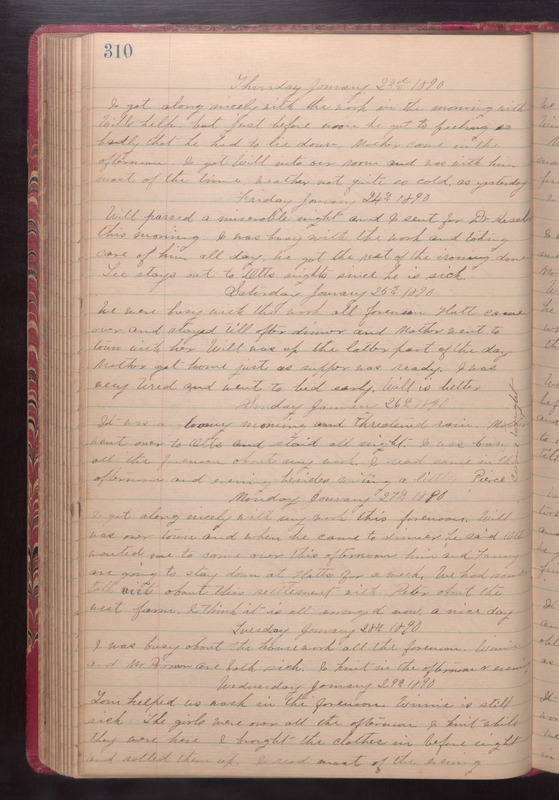 Wednesday January 29th 1890 Tom helped us wash in the forenoon. Winnie is still sick. The girls were over all the afternoon. I knit while they were here. I brought the clothes in before night and rolled them up. I read most of the evening.